Shiratake noodles are a miraculous low carb product that contain no carbs or gluten. They are made from a type of yam fiber and are common in Japanese cooking. You can usually find them in the refrigerated section over by the tofu and wonton wrappers – if not you can order them online in a variety of shapes. Some people find the texture of Shiratake noodles a little rubbery, but I don’t personally have a problem with it because it reminds me of rice noodles. If you’re expecting it to be like traditional semolina pasta it might be a little weird at first, but most people can get used to it – especially if you’re on a low carb diet and really missing rice and noodles. When you’re eating keto these are as close as you can get to real pasta – and when prepared right it will be a game changer. If you’ve been on the fence about trying low carb Shiratake noodles, I urge you to give them a chance with this recipe! I first experimented with the Shiratake noodles in my low carb Potsticker Meatball Asian Noodle Soup recipe, and I couldn’t get enough of it. 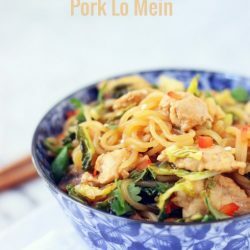 I knew I wanted to do a low carb lo mein style dish with them, but hadn’t gotten around to it until last week. I wish I had made it a priority sooner because this was amazing! Super easy, it cooks even faster than traditional pasta, so the entire dish only takes minutes to cook once your meat and veggies are prepped. 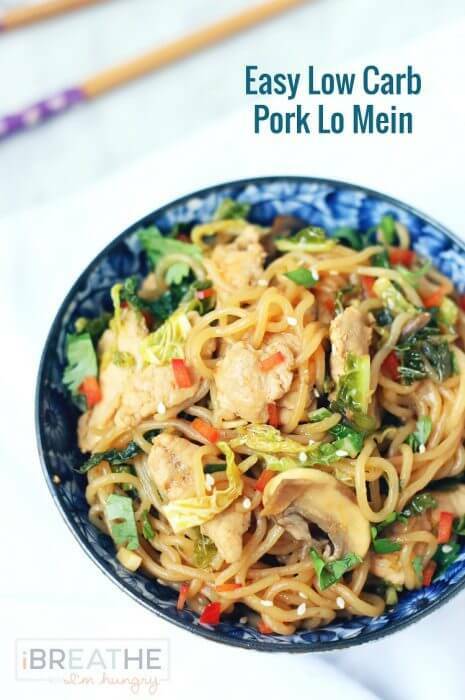 This is great for a low carb weeknight meal because you can make it at home faster than it would take to run out and get Chinese takeout from down the street – and it comes without the heaping side of guilt and shame! If you don’t eat pork, you can easily sub in chicken, beef or shrimp with excellent results! You can also throw in some snow peas, baby corn, bean sprouts, or other veggies according to your preference. The Shiratake noodles come out of the package very long which makes them hard to serve and eat. I cut mine up a bit after draining them to make them easier to manage – I recommend doing that before you toss them into the pan because once you mix them in it’s a little harder to do. Finally, you can adjust the heat (this is pretty mild as is) by adding some dried red pepper flakes or chopped fresh chili’s if you like it hot like I do! 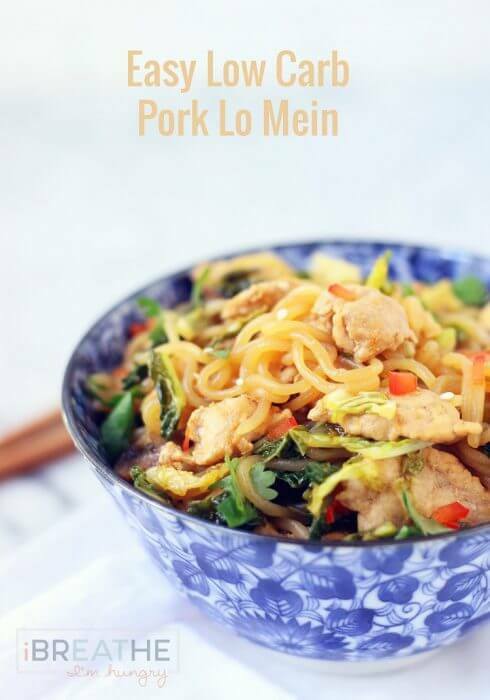 A delicious and super easy Lo Mein style noodle dish that is gluten free, low carb, keto, lchf, and Atkins Diet friendly! Open your package of Shiritake noodles and dump them into a strainer. Rinse them well and let them sit a bit to drain. If you’re going to cut them, you can do so now easily using clean kitchen shears – otherwise transfer to a cutting board and use a sharp knife. Set aside. Combine the pork and 1 Tbsp gf soy sauce and let it marinate while you prep the other veggies. Heat the avocado oil (or other) in a large saute pan. Add the pork and saute for about 2 minutes on high heat or until just cooked through. Remove the pork and set aside. Add the mushrooms to the pan and saute for about 2 minutes or until golden brown and slightly softened – add a little more oil if necessary. Remove the mushrooms. Add the garlic, cabbage and scallions to the pan and cook for about one minute or until slightly wilted and fragrant. Remove the pan from the heat and add your drained Shiritake noodles to the pan and toss with the greens. Let it sit while you make the sauce. In a small bowl, whisk together all of the sauce ingredients. Add it to the pan with the noodles and veggies and put back on the heat. Add the mushrooms and pork back to the pan and cook for 2-3 minutes over medium high heat until the sauce thickens and soaks into the noodles. Serve hot garnished with fresh hot chilis, fresh cilantro, and toasted sesame seeds if desired. So tell me – love Shiratake noodles? Hate them? Never tried them? I’m planning to do some more recipes with it so I’m just wondering if it’s something you’d be willing to try or not! And if so, what kinds of pasta dishes would you like to see recreated? More Asian recipes or would you rather something else? I am at your disposal!!! While you’re here, have you checked out the IBIH Community Forums yet? 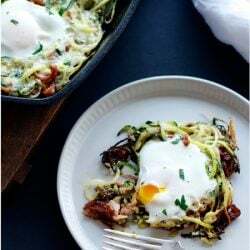 Lots of great support over there from fellow IBIH fans and low carbers so be sure to join the conversation – especially if you’re doing the Egg Fast Menu Plan or Weekly Keto Menu Plans! You should also check out the Cookbooks Page to get your copy of The Gluten Free Low Carber and any or all of my Ezines! I’m running a special of all five (over 150 recipes!) for just $19.99 – or you can get them piecemeal if you already have some of them and just want to complete your collection! was delicious! Please bring us more of your recipes and new ones with the noodles. This recipe is absolutely delicious. It has redeemed shirataki noodles for me. Only thing is my dish didn’t turn out as pretty as yours. Everything turned brown. But still delicious. Thank you for sharing! What is the serving size and nutritional facts on this? Made this tonight! Was unsure how I would feel about the noodles. This was GREAT! Hubby loved it too! I think this would even be good for vegetarians made with scrambled egg instead of meat. I used the fettucine Mircacle Noodles and loved the thicker noodle. I will be making this routinely for dinner. Thank you for coming up with this! Hi-I couldn’t find the Carb count for this anywhere? And fibre count? Hi Melissa. 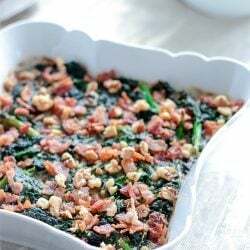 I love this dish (so does the hubs)! 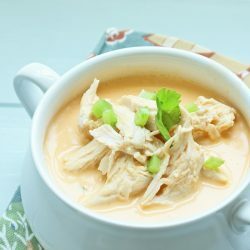 Did anyone ever get the macro count for this recipe? Thanks. Lots of IBIH recipes have been entered into My Fitness Pal – maybe they have it! Just tried this, but I adjusted some of the sauces because the ones I had were so carb-heavy. This was my first time using shiratake noodles and I love them! I even tried one raw just ’cause, and it was a little flavorless, but I really like the texture…then again, I really love chewy stuff xD I’d love more recipes like this! Bummed that even though there few requests there is no nutritional info. I am just starting Atkins and need a carb count. Do you mean for the entire recipe? There is no way this has more than 10g net carbs per serving – I’m guessing between 4-5g net carbs per serving, but I’ll try to calculate it exactly when I get back from my trip. Me the the husband LOVED this one! I made it with chicken and doubled the recipe and it ended up very saucy/salty so next time I’m just going to double the meat/veg/noodles and try a 1 or 1.5 sized sauce. Eagerly awaiting macro-count as well! Thank you, Melissa, for this amazing site and all that you do!!! I tried Miracle Noodles a while back. I threw out what I made. I couldn’t stand the taste. Perhaps I didn’t rinse them well enough? I’m willing to give them another try. I don’t cook much Asian food, but maybe I should start. This looks & sounds amazing! This is the second time I made this recipe and it is awesome! Thank you so much, Mellissa, for all of your excellent low carb meals. I would love more of these recipes. I use Miracle Noodles all the time. Once I figured out how to get as much water/moisture out of them as I could before adding to a recipe they became my favorite. Thank you for sharing all of your wonderful creations. Thanks! Good recipe. Going to try soon! I cook shiratak noodles all the time. My method to get rid of the smell maybe is even easier – I just rinse them well and parboil them in boiling water for a minute – smell is gone! They ARE pretty tasteless but with the right sauce could make a great dish. OMGosh!!! I am a total believer! I literally threw out the food I prepared the last time I tried these noodles. This recipe makes them so fantastic! I would never have believed that they were the same thing. I did soak them in salted water all of yesterday, and ran out of time so I stored them in fresh water last night and today until dinner time. Not a whiff of that fishy nastyness!?! Wow. Having a go at those noodles again-I confess…I hated them last time, but it wasn’t an asian dish. Hoping it will work out this time! Any luck with the nutritional info on this? I’m informally counting, and trying to watch my numbers. I tried this recipe and I’ve made it twice already!! It’s delicious! I’ve used shrimp in it and pork. I think I could eat it every day! It’s especially good if you make it, resist eating it, refrigerate and eat it the next day! All the lovely flavors sink into the Shiratake noodles and it is soooooo good! Thank you so much for this recipe! It was amazing! My noodles were great, prepared as you suggested. I found them in refrigerated produce section at my grocery store. I will def try more recipes with these. About how many carbs in an average serving (1 cup?) of this? It looks fabulous and I’m definitely wanting to try the Shiratake noodles. I’ve just begun eating low carb and try to stay between 20-50 a day-so far so good. I’ve lost 9 pounds in two weeks!! 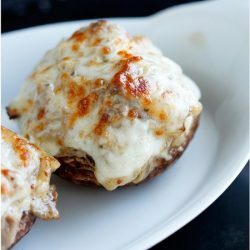 I have this site bookmarked and love reading all the good recipes. I found Miracle brand at Sprouts, my local health food store, un refrigerated, then read all the comments. I followed Gretchen’s suggestion about rinsing and letting the noodles sit in a pan of salted water (I was hungry, thus only for a short while), then boiling for about 5 minutes in the same water. I kept my expectations low, having read to use them only for Asian foods, and poured on the marinara I had prepared before reading that part. Happily surprised, it was a great dinner! I miss pasta, and will definitely do this again. Thank you! Mellissa, my boyfriend and I made this tonight and it was AMAZING. One of the best dishes we’ve cooked. Next time we’re going to try shrimp – I’ll let you know how it goes! this looks amazing! Do you have the nutritional info on this, or did I just not see it? Thanks. Thanks for catching that Eric – completely forgot! I’ll try to calculate that later today when I’m back at my laptop and update the recipe ASAP! Thanks again! i have SEEN shiratake noodles before at my store and i’ve actually thought of you and meant to ask you about them and (surprise surprise!) always forget. I would totally make this: i’m okay with a slightly rubbery thing where noodles are concerned. And this lo mien looks CRAZY good: bookmarking for when i grab some of these. I love using shiratake noodles in Asian stir-fries. I usually rinse and drain and cut them up like you do. I put them in the hot pan with a tiny bit of deglazing liquid right after stir-frying everything and let them cook and dry out a little bit and absorb the good stuff in the bottom of the pan. Stir everything back into the pan, heat, and serve. I feel no guilt eating a large serving of this–really satisfying and filling! I bought a bunch (2 dozen!!) of the ‘elbow macaroni’ style shirataki and really didn’t like them. As many people have noted it is more the texture that is weird rather than the taste. That being said, I think I will try the spaghetti style if I can find them in single packages ’cause your Lo Mein recipe looks really good! I was just looking at the Paderno Tri-Blade Plastic Spiral Vegetable Slicer at Amazon, have you ever tried it? The spiral “noodles” look interesting. 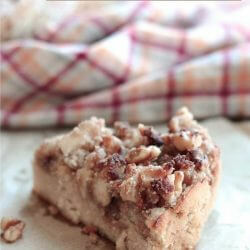 This recipes sounds and looks delicious! I would be careful with the Hoisin Sauce though, it usually has a lot of sugar as it is considered asian bbq sauce.. not sure what brand you used and the measurement does seem very small but just thought I would comment anyway. Keep up the great work with the recipes! I’ve been reluctant to try shiratake noodles because I’ve heard they can cause water retention and bloating. Is that not the case? I’ve never had that problem but I guess it depends on the person Ajax, also it depends on whether they are made with soy or yam and how you handle it! Let us know if you decide to try them out and how it goes!! I love the Shiritake noodles. Asian food seems the only way the noodles seem to work. But, your amazing. I’m sure you could come up with something great to make with them besides just Asian dishes. I love these noodles but it took a while to find an acceptable way to prepare them. I open them in the morning, drain, and rinse them with hot water. Then I put them into a pot of salted water and leave on the counter. 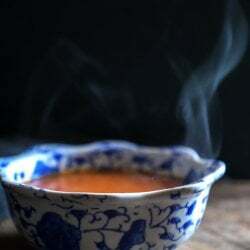 At dinner time the pot goes on the stove and the noodles are boiled – quite vigorously; they will not disintegrate. Then they are drained and combined with sauce – usually my husbands meat sauce that has been simmering for hours. The odd smell is gone and the texture is much more tender than fresh out of the package. 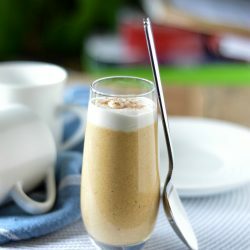 I hope this helps others to enjoy their favorite Mellissa recipes. Thanks for sharing your method Gretchen, I’ll have to try that – especially if I want to experiment with anything but Asian flavors! I loved the soup.. I even bought more noodles. Totally trying this one soon. Shiratake noodles are okay with Asian flavors, but I prefer the kelp noodles. I won’t ever use shiratake noodles with Italian flavors. That nearly doomed my ever trying them again. It’s hard for me to imagine too Jacqui but I’m going to see if I can adapt them to other recipes besides just Asian if I can. I won’t post them unless they are really good though. I haven’t tried kelp noodles yet, I’ll look for them next time I’m at the Asian Market thanks! Mellissa! 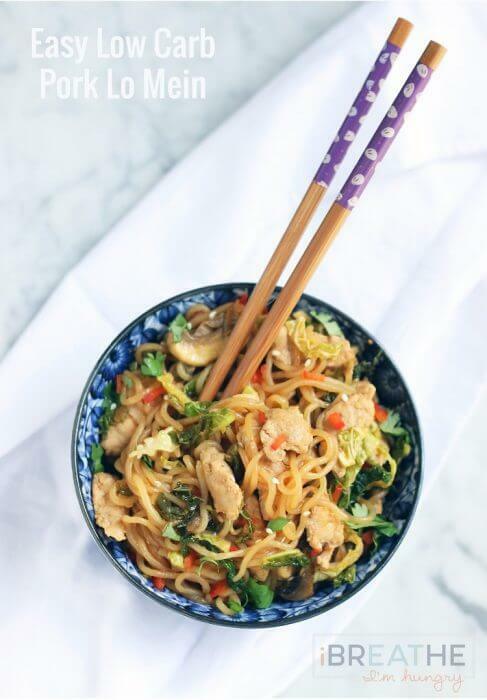 Do you have a brand of Shirataki noodles that you prefer in this dish? I followed your link above to Amazon, which do you use? Scott I’ve tried several and find them all to be pretty much the same – as long as they aren’t soy based any brand will do. I think pasta zero was the last one I tried. Nirashi is another good one but I usually only find it at Asian markets. Enjoy! I use a ton of the Miracle Noodles brand. I love the rice version, fettuccine and they newly have a ziti (though this one has a few calories per serving). I love that I don’t have to refrigerate this brand (and it is available as well via Amazon). I had not tried anything as elaborate as this dish, and will do so..this sounds nummy! TY! I didn’t know they made a version that doesn’t need to be refrigerated! That would be super handy, I’ll have to look for them! Hope you like this dish Pat, let me know how it turns out!!! I love shirataki noodles. Looooove them. To me, they’re even easier than pasta because all I do is rinse, rinse, and throw in my recipe. 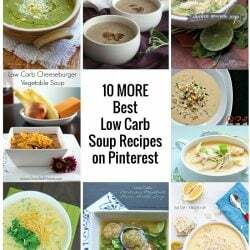 So I would really like any and all recipes that feature them. I’m going to try this recipe the next time I go to the grocery. All of those options will also work Ally! You probably know to add the zucchini noodles right before serving so they don’t disintegrate but I’ll say it here for anyone who hasn’t cooked with them before! Enjoy! I’ve been experimenting with Shiratake noodles a lot lately and I’ve found if you cook them for a long time (about 30min) in a sauce, they tend to soften up a little and lose some of the rubber-like texture. For Chinese dishes I will simmer them on the hob and keep stirring and for pasta style dishes I will fry off the noodles with my meat, garlic onion herbs etc then add chopped tomatoes and throw the lot in the oven for 30 min, then pull it out and top it with cheese and pop it back in for another 10min. You’re welcome Debbie and thanks for letting me know that everyone liked the soup!! !